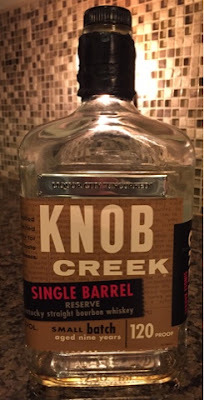 I would imagine that many a bourbon drinker has come across the problem that I have, at least in my case with respect to store select Knob Creek Single Barrel bottlings. The first such bottling I ever had, coined "Gallenstein Selection #3" from Liquor City Uncorked in Covington, KY was one of the best bourbons that I ever had the pleasure of enjoying. Since then, my buddy who makes those frequent trips to Covington has brought back other store selections, hoping to find another such honey barrel. Such is the case with this store selection. My buddy stated that this bottle was brought out from the back, and that it was supposedly from the same bottling. I questioned it, due in large part to the different labeling, but, in the effort to catch that unicorn (and because it is bourbon, after all), I was willing to give it a go. This particular store selection of the Knob Creek Single Barrel was heavy with caramel on the nose, along with some fresh apple. Its aroma gave of a very autumn, apple-picking and hay-rides kind of vibe. What's better is that it had a flavor to match. It reminded me very much of a caramel fudge sundae, with the caramel and cocoa flavors seemingly poured over the top of the underlying vanilla. However, this caramel fudge sundae came with a bunch of burn and a light peppery spice on the back end that seemed just a touch out of place. As is frequently the case, after the bottle was open for a while the burn receded significantly. The bourbon not only turned into a much smoother pour, but it sweetened up quite a bit. Gone were the cocoa notes and forward came the caramel flavor. It was still very much like a sundae, but without the burn behind it, it was very much a dessert-type bourbon! The last couple pours were incredibly tasty! While it wasn't my unicorn, this was still a fantastic bourbon. Those people at Liquor City Uncorked really have good taste in their selections!